The Department of Nutritional Sciences is a basic science department within the Faculty of Medicine. The location within the Faculty of Medicine enables investigators to draw on the extraordinary strengths of other basic science departments as well as the public health and clinical departments to explore fully the relationships between nutrition and human health and disease and to influence public health programs and clinical practice. The following are brief descriptions of a number of active research areas in the Department with a list of investigators involved. Many investigators are working in more than one area. Details of individual research programs can be viewed by clicking on the names. Research in the area of Bone Health and Osteoporosis is aimed at determining the mechanisms by which dietary factors alter calcium and bone metabolism and the interaction of genes with diet in the regulation of bone metabolism. By understanding these mechanisms, effective dietary strategies that promote the attainment of peak bone mass and/or prevent or manage osteoporosis during aging or in various disease states, can be developed. Approaches to this research involve clinical trials, cell culture systems and animal models, including use of knockout and transgenic animals. Dietary factors of interest include calcium and vitamin D as well as novel food components such as soy isoflavones, flaxseed lignans and specific fatty acids, namely conjugated linoleic acid and omega-3 polyunsaturated fatty acids. The goal of this program is to understand how different types of dietary carbohydrates, including sugars, starch and dietary fibre, influence human physiology and metabolism. There are 4 major areas of research including intestinal function, carbohydrate metabolism and diabetes, blood lipids and cardiovascular disease, and food intake regulation and obesity. The goals of research in this broad area include the investigation of lifestyle risk factors for chronic diseases, the examination of social and economic factors and current policy directions in relation to the dietary patterns and food security of Canadians, and the study of the impact of lifestyle management and technology on chronic disease prevention and management. Research questions in this area are pursued using methods common to epidemiology, qualitative research, consumer surveys, and community-based research. This research cluster focuses on human studies in health and disease to investigate the effects of plant foods and food components, dietary patterns, dherbs and botanicals, and drugs, and their effects in prevention and treatment of diabetes and cardiovascular disease. Together the research programs cover epidemiology, genetics, nutrigenomics, basic and clinical studies, clinical trials and health policy research. This research cluster has a strong tradition of collaboration. The goal of this program is to elucidate the nature and mechanisms of action of dietary factors that are involved in cancer causation, and to investigate preventive strategies. The Program focuses on three major diet-associated cancers of western countries – breast, colon and prostate. Current research ranges from basic/molecular to epidemiological approaches to the cancer problem. The Diet and Cancer Program is part of an extremely diverse and dynamic cancer research community at the University of Toronto. Program members interact with many investigators in other departments, hospitals and research institutes. Approximately two thirds of Canadians are overweight or obese, and are at increased risk for many chronic diseases including diabetes and cardiovascular disease. Research in this cluster is focused on environmental, genetic and physiologic determinants affecting food intake regulation and energy imbalance. Research approaches include studies using experimental animal and cell culture models, analysis of population food choices, and human studies involving adults and children. Functional foods and nutraceuticals are foods or food components that have physiological benefits beyond basic nutritional function. The goal of this research program is to elucidate the role of these foods in the prevention and treatment of chronic diseases such as cancer, cardiovascular disease, diabetes, osteoporosis and obesity and regulatory aspects related to their use in Canada. The current emphasis is on phytoestrogen-rich foods such as flaxseed, soy and sesame seeds, as well as ginseng, konjac mannan, salba seed, lycopene and tomato products, tea, dietary fiber and low glycemic index foods. Fats are essential for satisfying basic nutritional needs, but increasingly we are discovering that certain types of fats are detrimental to health while others are beneficial. Research in this cluster focuses on understanding the precise relationship between dietary fat and diseases such as cancer, cardiovascular disease, diabetes, and fatty liver syndrome. The objectives of ongoing research relate to understanding mechanisms of action with the long-term goal of developing strategies for the prevention and treatment of these diseases. Research approaches include cutting edge molecular studies using animal and cell culture models, and human clinical trials. Research in this area uses genomic information along with techniques in molecular biology and genetics to investigate the role of gene-diet interactions in health and disease. Studies examine how genetic polymorphisms modify the response to dietary intakes and how dietary factors regulate gene expression. Experimental approaches involve cell culture, animal, clinical and epidemiologic studies including the application of microarrays and large-scale genotyping. Research in this area examines the susceptibility of brain to fluctuations in nutrient intake, with changes in both brain metabolic processes and behaviour as outcome measures. Studies encompass various stages of the lifespan, ranging from pediatrics to geriatrics, and involve diverse outcomes including cognitive function, mood disorders, appetite regulation, and susceptibility to neurodegenerative disorders. Acute and chronic diseases affecting major organ function can negatively impact nutritional status that in turn may contribute to increased morbidity and mortality. Since malnutrition is often reversible, efforts are being aimed at improving ways of identifying and correcting nutritional inadequacies that may improve disease outcome. This research area also attempts to delineate physiological and metabolic mechanisms underlying disease processes, which serves to guide most appropriate nutritional intervention strategies. Research in this area focuses on the application of epidemiological approaches to understand the impact of diet and related factors on health and disease in human populations. 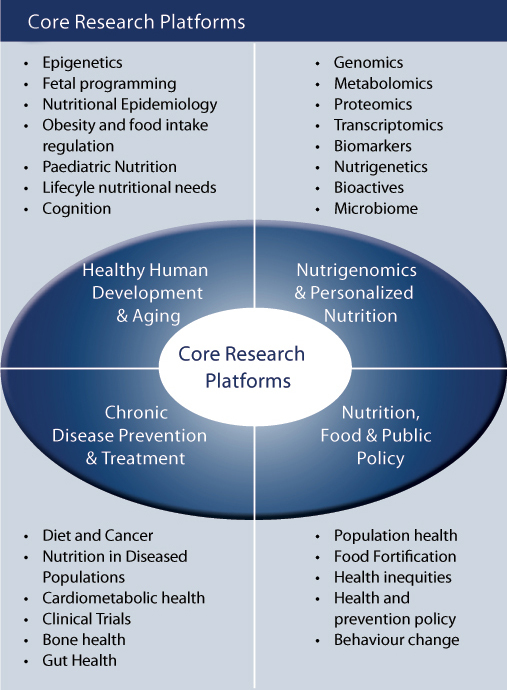 In addition to studying the role of individual nutrients, foods and dietary patterns on health outcomes, members of this cluster also assess the importance of nutritional biomarkers and gene-diet interactions. Finally, investigators in this group evaluate the potential of novel lifestyle modification strategies to prevent and/or manage chronic diseases and associated complications. Research in this cluster explores the adverse effects of dietary factors on biological systems. Toxicogenomic studies using cell culture and animal models aim to identify harmful compounds in the diet. Regulatory aspects of food safety evaluation are an additional interest. The Paediatric Nutrition group focuses on the nutrition and growth in neonates, children and young adults. As maternal nutrition may impact on the nutrition of children, this stage of the life-cycle is also a part of this program. Studies are being conducted on the requirements for various amino acids, a novel approach for preventing iron deficiency anemia, folate metabolism and human milk fortification for premature infants. Much of the research in this area is conducted a The Hospital for Sick Children and St. Michael's Hospital. Current research ranges from basic bench-top laboratory analyses to clinical work to community-based interventions in Canada and in developing countries. Protein and amino acid metabolism is being studied across the life cycle from preterm newborns to the elderly and in health and in disease. In addition, the requirements of dietary essential amino acids are being determined using the novel technique of Indicator Amino Acid Oxidation. The effects of diseases such as inborn errors of metabolism (Phenylketonuria and Maple Syrup Urine disease) and chronic kidney and liver disease on essential amino acid needs have been studied directly for the first time. The focus of the work is with humans but animals are also used with the pig as the most suitable non-primate model for the human. Vitamins and minerals have vital roles in human health throughout the life cycle as well as in chronic diseases such as cancer and osteoporosis. Some studies are focused on different stages of the life cycle with emphasis on developing strategies to prevent iron deficiency anemia in infants and children and understanding the factors affecting folate status of women, infants and young children. With respect to aging, studies on the role of vitamin D and calcium in the prevention of osteoporosis and fragility fracture are ongoing in clinical and animal trials. The role of folate and vitamin D in modifying risk of various cancers (breast, colon, prostate) are being studied using cell culture systems and clinical trials.